I have been playing the guitar since 1961 and have had wide performing experience. I have performed solo and with groups both on radio and TV, and played on many recording sessions. 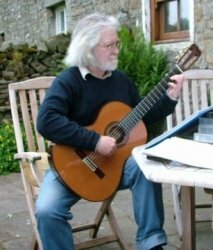 I studied classical guitar in London with the John Duarte and have taken part in various master classes.I have had guitar books published including Early English Music for two Guitars and Easy Baroque music for Two guitars . I also play the Lute and the Baroque Guitar. I have been tutoring the guitar for over 35 years. I can teach all styles Classical, Flamenco, Blues, Jazz, Rock, folk etc, to advanced levels. I prepare students for both the ABRSM practical and theory exams and also GCSE examinations. Lessons are also available in both Lute and Baroque guitar. Lessons are usually on a one to one basis, however tutition can be arranged for more than one pupil at a time [ eg. child with a parent at no extra cost. ] Music reading is taught but is not compulsary. Exams can be taken with the ABRSM other examination can be arranged ie. Rock School. Classical guitar is taught from grade 1 to 8 and diploma level.